This document is suitable for any individual or company selling or buying a company or a proportion of the shares in a company. It is usual for the buyer to produce the sale document but there is no reason why the seller should not obtain an advantage by making the document his and thereby obtaining the advantage of preliminary editing in his favour. It is therefore a suitable also for a seller of a company wanting tips and hints as to what is fair and reasonable in a document comparable to the one now presented to him by the buyer or his solicitors. Use the table to select which of our documents bests suits you. Note that the type of business is generally of low importance. You can use one of these templates to buy a trout hatchery or an architect’s practice. Warranties protect the interest of the buyer, who does not have the information available to the seller. It is fair and reasonable for a buyer to demand warranties and for a seller to give them. However, it is quite easy for a buyer to use warranties to “improve” his original deal. So, if you are a seller . . . . do not give a warranty if you do not know whether it is true, but do be prepared to “go and find out” information that could be within your knowledge. 150 warranties sounds an awful lot. Do you really need them? Will you understand them. Net Lawman advises: absolutely yes and absolutely yes! Our warranties are written in plain English. A seller should start with a full set unless he is sure he knows everything there is to know about his proposed acquisition, or the value is very small, or the company is not trading. Net Lawman document templates offer around 150 “full” warranties, or a reduced set of around 115. Either way, around 30 cover real property, so if your company has none, the number comes down. You may be interested in a share sale agreement, or alternatively, business sale agreements. Some similar documents are linked on the right of this page. Alternatively, go back to the category page and choose again. Provision for some Sellers to be trustees and not therefore bound by the Warranties. 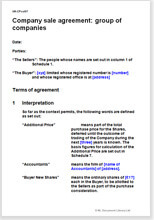 And up to 150 individual warranties are in sections relating to: the effect of this agreement, group structure and operation, accounts, cash flow, taxation, banks and borrowing, assets, trading and contracts, business matters, litigation and regulation, properties - freehold, leasehold and let, employment, pensions, insurance, intellectual property, Internet and domain names.